Hammersmith Apollo is one of London's major live entertainment venues. It is located in Hammersmith, West London and is one of the UK's largest and best-preserved original theatres. 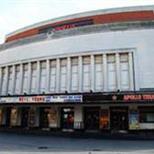 The Hammersmith Apollo is famous worldwide for performances it has hosted in it's glittering history. Many comedians such as Michael McIntrye and Jack Dee have had their live DVDs filmed at the venue and it played host to the hit stand up TV series 'Live At The Apollo'. Music DVDs have also been filmed at the venue from artists such as Thunder, The Saturdays and Judas Priest to name a few. Venue Rules - Current England & Wales Licensing laws are strictly enforced - Ticket holder may be subject to search - Tickets are non-refundable or transferable - The venue reserves the right to change the bill without prior notification. - Ticket holders consent to any filming and sound recordings as members of the audience - Ticket holders may be subject to continuous sound levels which may cause potential damage to hearing - Ticket holders may be exposed to strobe lights - Only official merchandise is on sale inside the venue, do not buy outside. This is for your protection so that you will receive goods of proven quality. - No 'professional' type cameras, video cameras or sound recording equipment will be allowed in the venue. - No re-admission policy is strictly enforced - No bottles, cans, alcohol or food is to be brought into the venue - No illegal substances may be brought into or taken on the premises. Any one caught in possession of such substances will be ejected form the premises and may be reported to the Police - Any ticket holder throwing objects (beer, glasses etc) will be removed from the building and no refund given. Furthermore, customer details will be provided to the regulatory authorities should an offence be alleged to have taken place. - The venue management accepts no responsibility for acts of willful endangerment, or injuries caused thereby to yourself or other patrons whilst on the premises. - No weapons. The management reserve the right to define & confiscate - No smoking anywhere within the venue complex - at it's discretion the venue management will allow smokers out of the venue. Management reserves right to refuse admission The Venue adopts a neighbour friendly policy so please make as little noise as possible on leaving the venue. Nearest Tube: Hammersmith (Piccadilly & District lines) & Hammersmith (Metropolitan Hammersmith & City line). There are 2 underground stations at Hammersmith. They are 3 minutes walk from the venue & are accessible by underpass. The Hammersmith Apollo does not have any parking spaces and we would advise customers not to drive and park in the surrounding areas due to it being mostly residential areas and car crime being at a current high. It is possible to drop off directly outside the venue on Queen Caroline street. Dial-a-Car 0208 563 8888 / 0207 835 1111 Why not book a cab in advance to the Apollo and back? Visit minicabit.com for a cheaper, easier deal. The nearest 24-hour car park is located behind the Kings Mall and accommodates 1000 cars. The car park can be entered up until 20:00 and cars can be collected anytime. Novotel London West, located 3 to 5 minutes walk from the Apollo offers great and secured car park facilities. Up to 240 bays are available on a first come first served basis. Prices are ú3.00 an hour or ú1.00 an hour if you are staying at the hotel. For information regarding Blue Badge holders' parking please visit the LB Hammersmith & Fulham website. There is an access ramp at the front entrance of the building or 2 steps from the street into the venue. The foyer and bar area into the auditorium is step free. The circle seating area is only accessible via steps .Unfortunately there is no lift to the circle area. There are: - 30 steps from the main entrance to the circle foyer. - 10 steps from the circle foyer to circle auditorium entrance. - 12 steps from circle auditorium entrance Row F to A. - 39 steps from circle auditorium entrance Row G to Z and rear circle standing. For example, if you have a seat in row F of the circle there are a total of 52 steps. The wheelchair viewing platform is located at the rear of the stalls and can accommodate four wheelchair users and four personal assistants per performance. Any wheelchair user that is able to transfer from their wheelchair into a stalls aisle seat are preferred to do so. As the venue can only accommodate four wheelchair users on the viewing platform it is preferred that these areas are reserved for those that are unable to transfer into a seat. Your wheelchair can then be stored at the rear of the stalls and returned by an usher at the end of the event or as and when needed. The venue has a hearing loop system that covers rows J-R in the Stalls, plus blocks 8,9 and 10 in the Circle. Amplification headphones and neck loops are available for a refundable deposit of ú5. Please speak to the Box Office staff upon arrival to collect a unit. Guide dogs are welcome into the venue and the staff are happy to look after them during the performance. If you are bringing a guide dog, please call 020 8563 3806 to inform the venue in advance. For access requirements, please call 020 8563 3800 and choose option 2. Alternatively you can email info@hammersmithapollo.net for more information. The line opens at 10:00 and closes at 17:00 and operates Monday to Friday. Please note that no other query can be dealt with on this number.